People relax in Rittenhouse Square on Wednesday, the morning after a shooting. An arrest warrant has been issued for a 17-year-old boy who shot a Good Samaritan on a bicycle in Rittenhouse Square five times Tuesday night after the cyclist tried to stop the teen from robbing a couple at gunpoint, according to police. Lt. John Stanford, police spokesman, said the teenager's identity would not be released because he is a juvenile. He would be publicly identified only if the District Attorney's Office decides to charge him as an adult, Stanford said. The teen lives in South Philadelphia, but police did not find him at home Wednesday. Stanford said authorities contacted the boy's parents, who were cooperative, but he had not been found as of 7 p.m. Wednesday. "This was not a random incident at all," Stanford said. "How deep that relationship goes still remains to be determined, but they knew who the guy was and the offender knew these complainants." But the 39-year-old cyclist who came to the robbery victims' aid is not believed to have known anyone involved. Stanford said the cyclist frequents Rittenhouse Square, where he often sells bottled water. According to police, around 9:30 p.m. the teen and an unidentified co-conspirator tried to rob the victims at gunpoint near 19th and Walnut Streets. Initial reports said three to five people were victimized, but Stanford said only the 22-year-old man and 18-year-old woman were there when police arrived. When the cyclist saw the robbery in progress and tried to intervene, the 17-year-old grabbed the gun from his co-conspirator, Stanford said. A brief struggle ensued and the teen shot the cyclist five times in the chest, torso, and shoulder. The gunshot victim was taken to Hahnemann University Hospital, where he was listed in stable condition Wednesday, police said. Authorities did not release his identity. No one else was injured and nothing was taken in the robbery attempt, police said. Shirley Thacker, 67, who has lived on Rittenhouse Square for more than 20 years, and Joanne Tubman, 63, who moved there in August, were walking their dogs in the park Tuesday when the shooting occurred. Thacker said she heard four or five "pops" around 9:30 p.m.
"I said, 'Those are gunshots. Run!' " Thacker recalled. "Now I know how stampedes can start. Everybody just ran. I didn't know there were that many people in the park." Thacker and Tubman said dozens of people ran from where the shooting occurred toward where they were, near Rouge restaurant on 18th Street near Walnut. Thacker said she stopped traffic so people could flee across 18th Street. "It was like something out of a movie," Tubman said. "But it was real. Very real." Tubman said the cyclist who tried to thwart the robbery was a "Good Samaritan." "I think he probably acted on instinct," she said. "Poor guy got shot for being a good person." By Wednesday morning, no indications of the shooting could be found in the square. Babies in the park practiced hobbling to their nannies. Elderly men walked their beloved dogs. And businessmen in suits sat on benches next to tattooed men in tattered clothing. In fact, many people lounging in the park hadn't heard about the shooting. A 75-year-old Rittenhouse Square resident out in the park with her 1-year-old grandson said she hadn't heard of the shooting and didn't hear it happen Tuesday night. "It's strange because I've seen a lot of security and it's odd they wouldn't be here in the evening," said the woman, who declined to give her name. "It's very odd. I always feel safe here." Mitch Harewood, 48, a male nanny – or "manny" as he termed it - and Sheri Davidz, 30, a nanny, played with toddlers in their care on a grassy area of the square Wednesday. They said the shooting is a reminder that crime can happen anywhere. 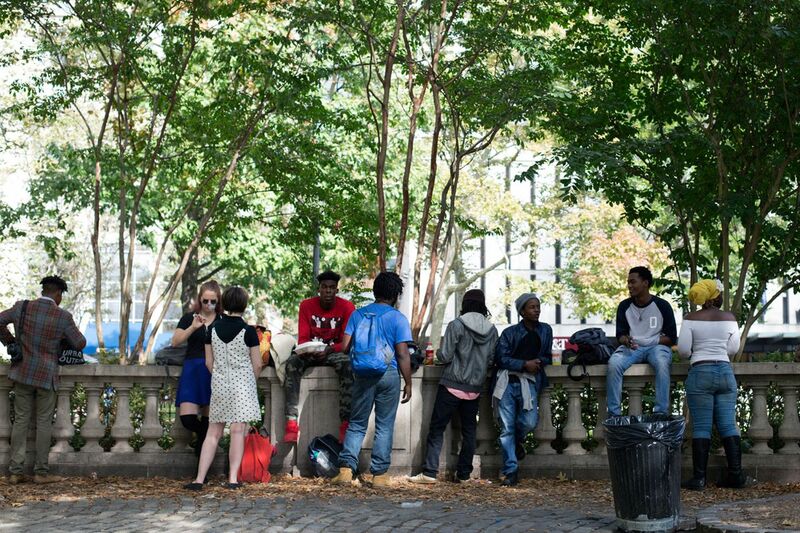 "It might be Rittenhouse, but it's still a public park," Harewood said. Davidz agreed. "There is no door as to what people can come in and out of the park," she said. Harewood and Davidz lamented that the shooting seemed to be attracting more media attention than others in the city because of the location. "It's sad. It doesn't have to happen in Rittenhouse Square - it's sad when it happens anywhere," Harewood said. In fact, the Rittenhouse shooting was one of four shootings in the city between 7 p.m. and midnight Tuesday. The other three - none of which was reported as fatal - were in North, West , and Southwest Philadelphia, authorities said. The Rittenhouse Square shooting was the second notable violent incident there this year. Around 2 a.m. March 13, Steven Simminger, 40, allegedly stabbed Colin McGovern, 24, of Bucks County to death after the younger man made a comment about the older man's sports cap and the two got into a fight. Simminger, a military veteran, is awaiting trial on charges of first- and third-degree murder.